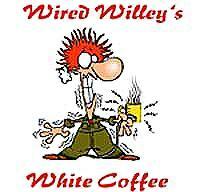 Wired Willeys White Coffee has a unique nutty flavor along with the maximum amount of caffeine. Extremely lightly roasted. Take care when making espresso drinks as this coffee expands on brewing. Do not tamp.